Today is March 14th and it’s Pi Day, which has nothing to do with pie, but is an annual celebration of the mathematical constant Pi, which you may remember from math class, is a really long number that’s rounded to 3.14. But that’s not the important part, what’s important here is that Pi Day is celebrated by restaurants with deals on pies and pizzas and here’s where you can find discounts and freebies today. BJ's Restaurant & Brewhouse- Score a mini one-topping pizza for just $3.14 when you dine in today. Blaze Pizza- Download their app to get a pizza for $3.14 today, but you have to order in person to get the Pi Day deal. Boston Market- Buy one chicken pot pie and a drink and get a pot pie for free today, just be sure to bring in this coupon. California Pizza Kitchen- CPK is serving up slices of its Key Lime Pie today for just … wait for it … $3.14. Cheddar's Scratch Kitchen- They’re running a “pie one, get one” deal for Pi Day, if you buy one chicken pot pie, you get a second one to bring home and bake later. 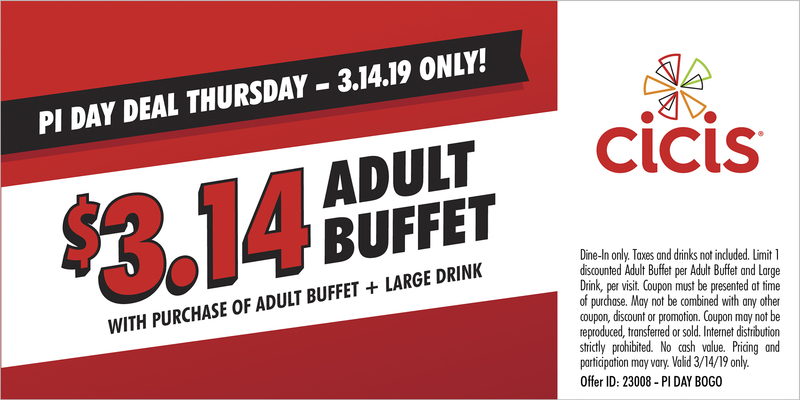 Cici's- Buy one adult buffet meal and a large drink and get another adult buffet meal for $3.14 with this coupon.